Super-slim Bookmark with powerful Electronic English Dictionary ... kids love using this! No-one wants to lose the plot right in the middle of a book when they bump into a word they don't understand! Here's a neat idea that means you don't even have to scuttle off to the bookshelf to find out. Our Dictionary Bookmarks have taken an English Dictionary with 38.000 definitions, shrunk it down to size. popped on some helpful buttons and well, made it sleek and really rather gorgeous. So now the answer you seek is right here at your fingertips, meaning you can type in and read on all from the comfort of your own book! Best of all about this dictionary is its simplicity (switch on and go), dictionary quality, and very reasonable price. This dictionary is ideal for children, and great for adults too! 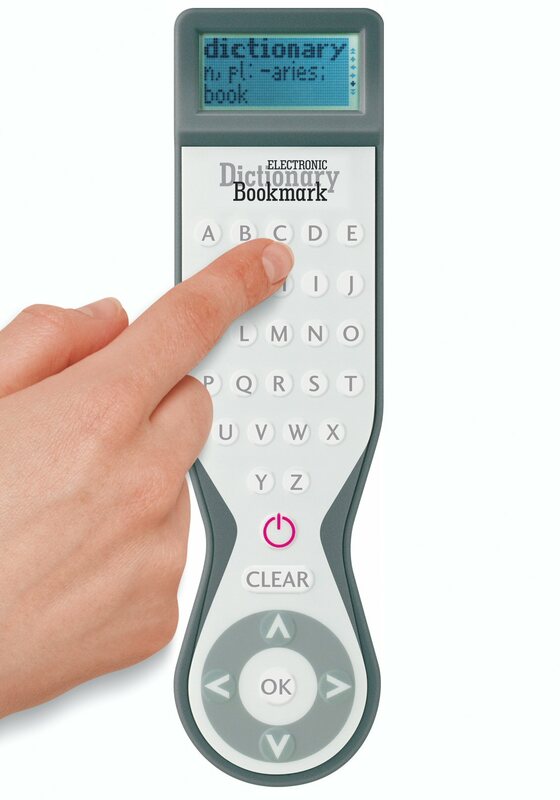 This small electronic bookmark has been crammed full of 38,000 definitions from the Collins Gem English Dictionary. When you come across a word you don’t know, simply press the power button to begin, type in your word on the keypad and press OK to find out what it means. Children love using these dictionaries, which really encourage children to read more and learn new words.